The OptoSigma 123-0140 Aluminum Crossed Roller Bearing Stage XY is a inch stage, having the top of the 40mm square surface drilled and tapped to accept english fasteners. The Crossed-Roller bearings give more precise travel and higher load capacity- 2KG. 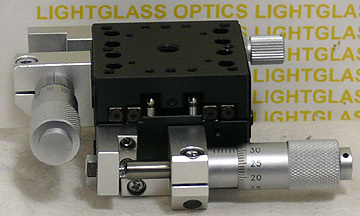 The OptoSigma micrometer actuators are included in the price and offer 13mm of travel in both the X and Y axes.